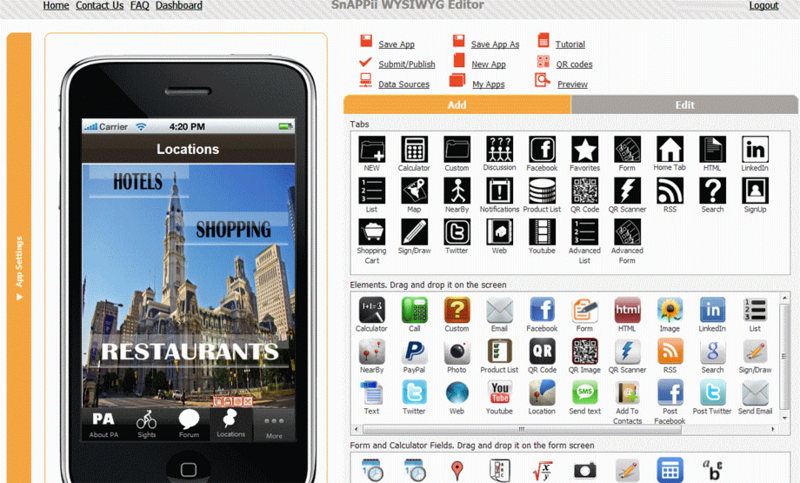 The web based visual development editor allows you to build applications using a simple drag and drop user interface. Add or change functionality in seconds. Customize your screens and tabs with your own design and feature elements. - Build your own apps when and where you want. All what you need is an Internet connection and a laptop/PC. Nothing to download, just open a browser, find the Snappii website and start your app. Make custom, native apps in minutes virtually any time! 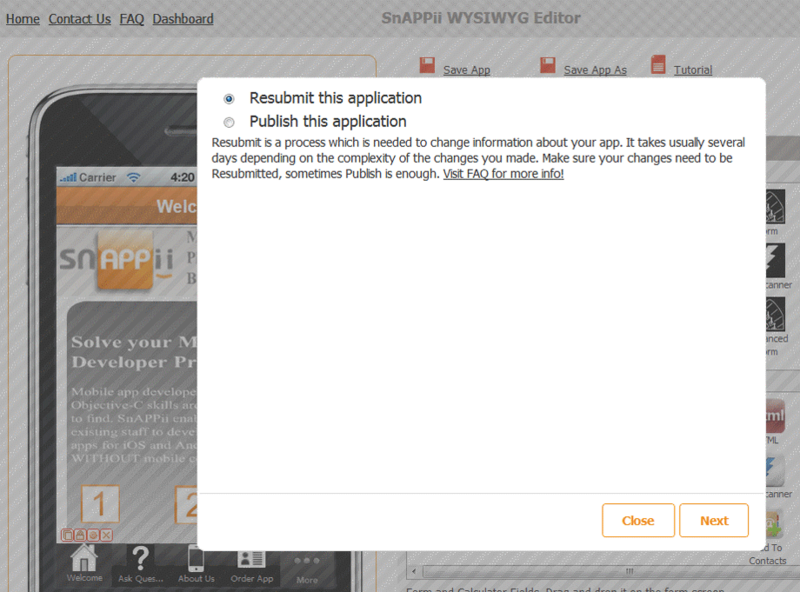 While you are making an app you can also simultaneously test it on the Snappii App and see the changes at once. Build your app once and Snappii will generate native iOS and native Android versions. - With Snappii, you can create an app on a platform-neutral canvass. When you’re ready, simply check off the platforms for which you want your app to be generated and you’re done! Build sophisticated data driven native apps that leverage data from both internal enterprise systems as well as cloud based applications. - Snappii has already prebuilt some data connectors to connect to various web services. You can take advantage of these or upload your own connectors to retrieve and post data from internal web services and cloud based apps. For example, using the SalesForce connector you can pull all necessary information about your leads/clients. Upload their contact info from your device immediately after your meeting and the data will be automatically be updated under your SalesForce account. Making and distributing app changes takes literally minutes and doesn’t require you to be a programmer. Anyone can create changes fast making the total cost of ownership with Snappii a fraction of apps requiring source code changes. Build apps and simultaneously view changes on mobile devices with the Live Build Preview App. Your development team can work in real-time facilitating quicker feedback as changes are automatically visible to the entire team on their mobile devices. 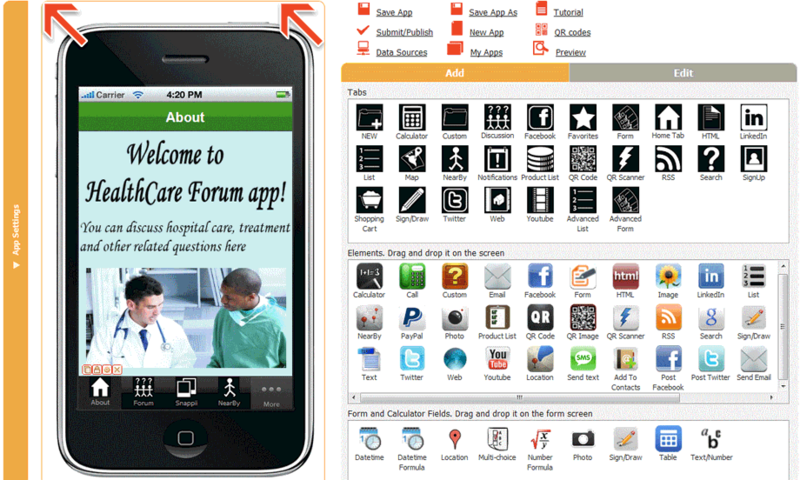 - The Web2Phone copy allows an active test version of the app to run on an iOS device before it goes live. This affords the opportunity to showcase your app to potential clients to make the initial sale or before the final product is released. Snappii generated native apps can use database to store information on device. Once internet connection is re-established, the data can be forwarded to central database, network drives or ERP and CRM backend systems. 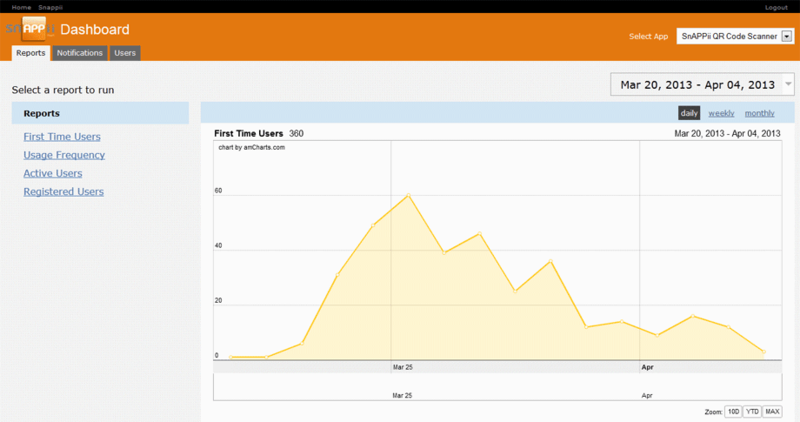 Use the dashboard to measure user analytics and improve app performance. Leverage continued feature and functionality updates to enhance the user experience. You have total control over the User Interface down to the pixel level. Build apps with full control over the layout. Unlike a template-based approach, you have complete control over the UI laying out each element – texts, images, multiple buttons, etc exactly how and where you want them. Enables customers to submit data to you 24x7 in the format you determine. Collect, store and send information from customers, partners, clients, and employees. Any data in business - documents, photos, GPS locations, digital signatures, etc can be turned into a form for capture. Create custom lists for locations, products, services and employee data. Information can be easily created, added and edited as needed. You can create multi-level drill down layers of information to customize any data for your database. Shopping cart functionality with Paypal integration to develop merchant apps that sell products, services, memberships. Make a list of products or services you wish to sell, add them to the shopping card and pay for your order using PayPal functionality! Create custom formulas to calculate orders, measure project specifications, and develop productivity tools. It doesn’t matter whether you are planning to create a simple calculator to calculate tips on a restaurant bill or a complex one to count gallons of gas, water, etc for a utility company. Snappii calculating controls will enable you to implement any calculator format depending on your or your business needs. GPS enabled to provide users with location information including mapping and directions. Enables you to create lists of custom locations and show them on the map. Display the branches of your companies, your restaurant networks, your shop departments etc. Anything that can be defined geographically including: business locations, products and employees can be tracked and reflected on a map. Fully integrated with Facebook, Twitter, LinkedIn, YouTube, RSS feeds, etc. 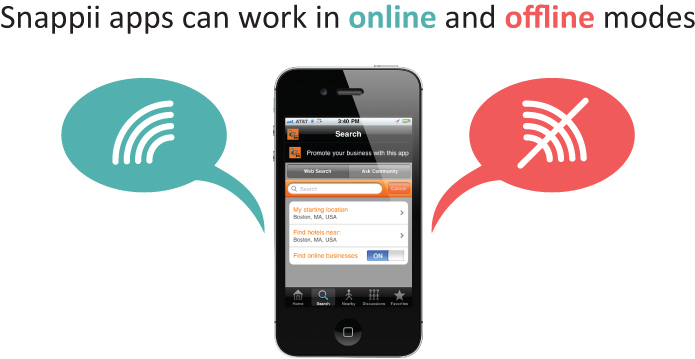 Allows you to stay connected with business associates, employees and customers through LinkedIn, Facebook and Twitter. You can also upload RSS feeds to company news (blog feeds) or any blog, magazine, newspaper or other outlet where an RSS feed is present. Add QR codes and scanner capabilities to your apps for many uses. With the help of the QR code Creator you are able to create various QR code that, when scanned, will show your business locations, make an appointment, redirect to a website, run a YouTube video, send an email, show text and share contact information. You can also reward your clients by offering them special deals and discounts. Signup and login features to capture user information and control access rights to individual screens and tabs. Create multiple levels of access in your app allowing some content to be available only to specific users. Supports O-Auth protocol for user validation providing the ability to log users in to a variety of web based systems for authentication via LinkedIn, Twitter, Facebook, etc. Schedule and send push notifications to users to promote news, events, appointments and special offers. You can promote your business and let clients know the latest news, special deals and other information you want to convey quickly and easily. Connect to websites, web based applications and internal databases with RESTful API web services. Send and retrieve critical information and mobilize business processes. With Snappii it is now possible for customers to connect native apps with different RESTful API web services. There's no need to be a programmer or have any development skills to be able to create an XML data connector and add a web service to an app. 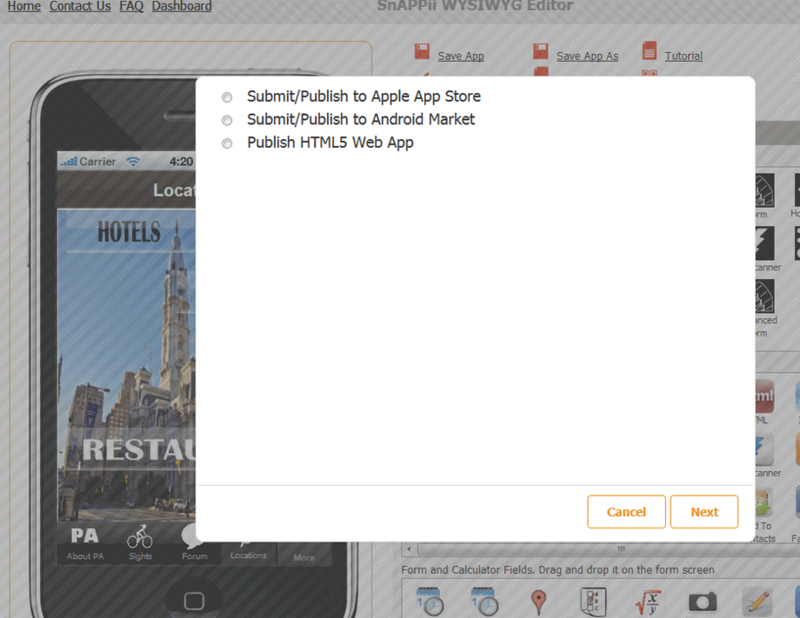 Snappii has several pre-built XML connectors you can implement within your app(s). Or follow our step by step instructions on how to create a new connector to suit your needs. Make mobile apps in 17 languages with Snappii. Select any of the 17 available languages in the Snappii WYSIWYG editor and start making an app in your own native language. Snappii supports the following languages: English (U.S.), English (UK), French (France), German, Simplified Chinese, Italian, Spanish, Portuguese (Brazil), Portuguese (Portugal), Swedish, Korean, Japanese, Russian, Arabic, Hebrew, Danish and Dutch. Start discussions, ask questions, have dialogs with Discussion Forum. Use Discussion button to enable you app users interact with each other and with you. Your customers can ask questions and receive answers from you and your other users. Add a news feed in your app using RSS button. RSS buttons allow you and your app users read news right from your website. If your website doesn't have an RSS, then you could add an RSS from another newsfeed, your twitter feed or even use it to provide weather updates. Sign e-documents and confirm purchases easily right in the app. The Sign/Draw form field allows you to get signatures from users which could be beneficial for important documentation and purchases. Users can also use the tool for drawing which can be useful for purposes like quickly sketching out a new product design. Take, share, e-mail, post and store pictures using the Photo Button. The Photo Button lets you create apps that leverage the mobile device camera to take pictures which can be shared, emailed, posted to a website, and sent to a corporate database. The camera has become a scanner of sorts to take pictures of documents and for other personal and business needs. The uses are endless and an easy way to allow visual submission of information quickly and easily. Enrich you app opportunities using HTML button. You can extend your app with HTML coding to further enhance functionality, for example, use in-app HTML to create custom database queries, registrations, integration with other systems, etc. You can even re-use existing HTML code from your website. Anything you can do in HTML can be encapsulated in this control with limitless functionality. Help your customers search your website, the Internet and physical stores for information about your products. The Search Tab allows you to either browse a specific site you enter, or search via the internet for a specific keyword. Enrich you app opportunities using JS Plugin button. Using Widgets you can create your apps easier and faster. Create tabs/buttons with predefined contents and save them as widgets to further re-use in other apps. Make required features once and deliver them to all the apps you are building. 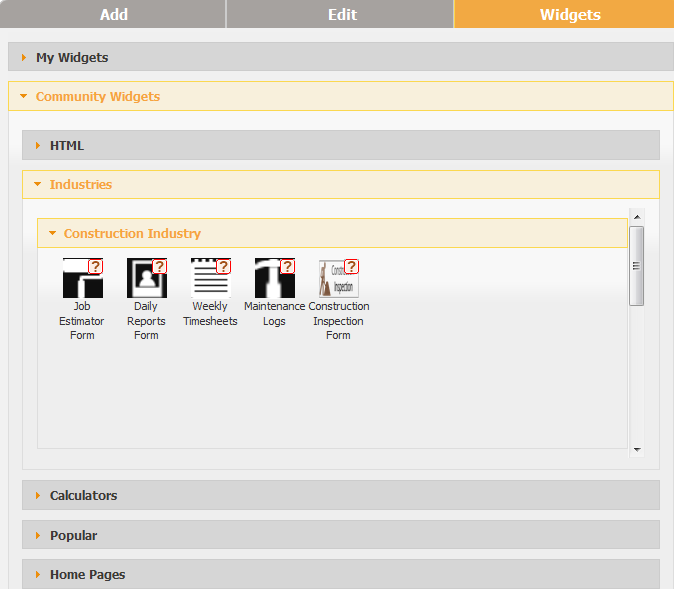 In the Snappii editor you can find and utilize many useful widgets created by Snappii team and add your own if needed. Challenge Snappii to build your enterprise-ready mobile app prototype in as little as 48 hours!